After a presentation from a NHS Blood and transplant representative The Pulse decided to take action. Instead of just talking about giving blood, four Pulse reporters decided to set the example. Overcoming personal phobias, Jack Draper, Emily Sims, Lilly Mafia and Leah Christou all registered to be new blood donors, and are all going to give blood on the 18th of December. The whole event will be covered by Live Pulse editor Ayshe Zaifoglu and will be a big feature in the Christmas issue of The Pulse. Every blood donation potentially saves three lives. This Christmas The Pulse hopes to give twelve people a gift that really means something. Lilly Mafia, the reporter behind the event, said "As Christmas has become a commercial event with people giving presents and spending lots of money, we decided at The Pulse that it would be more worthwhile to give blood instead". "Although Leah and myself are extremely nervous about the process," she went on to say, "we want to do this both to conquer our fears and do something that really matters at this time of giving. Leah’s fear is of the needles, as she has never had blood taken before and has no idea how much it hurts. My fear is of seeing and feeling the blood leaving my body." With our student newspaper attracting thousands of views every month, the intrepid reporters hope they can make a real impact. 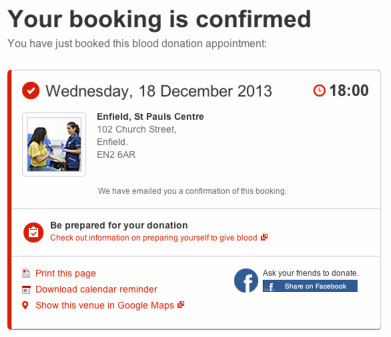 At the moment only 4% of eligible people donate blood - a shocking statistic Chingford students are looking to address.